We want to thank Dr. Wilson for speaking to our group in March. 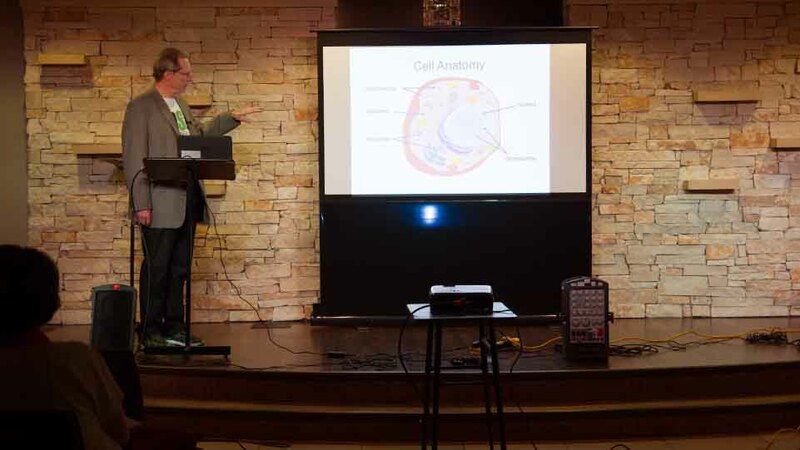 Dr. Wilson began speaking about the importance of ATP on mitochondria regeneration in the treatment of Lyme. Things that cause a breakdown of course is infections, stress, pollutions, heavy metals, drugs and poor diet, etc. The inner membrane is also loaded with proteins involved in electron transport and ATP synthesis. This membrane surrounds the mitochondrial matrix, where the citric acid cycle produces the electrons that travel from one protein complex to the next in the inner membrane. At the end of this electron transport chain, the final electron acceptor is oxygen, and this ultimately forms water (H20). I just recently begun LDA for symptoms of which we believe at this time to possibly be food allergies. The LDA treatment are given every 8 weeks. Yet, the downfall is that there are very strict guidelines to follow for three days where you must keep yourself away from anything that could inhibit the treatment. For the three days there are very strict eating guidelines, and you may have to be off of your medicine for 3 days to 3 weeks, depending on what you take. Yes, it feels inconvenient, but so does feeling poorly every single day, so I am willing to give it a try. LDI is a new treatment for those suffering from one or more of the three B’s: Bartonella, Babesia, Borrelia. You can get this at the same time you recieve your LDA, yet the guidelines for this are a little less strict. It is almost a vaccine, if you will, to treated your immune system and to make it to where your body can fight off the infections. We always learn a great deal from Dr. Hamel. We love him so and appreciate all his efforts in helping our community. Have you ever wondered how useful and efficient it is to use the CD57 count as a marker in identifying if you (1) have Lyme (2) is is getting better or worse? On February 21, 2015, Ginger Savely spoke to the North Texas Lyme Group through teleconference. We were still getting used to all of our equipment and has a few glitches, but in the end we were able to get Ginger’s presentation up and running. Whew! Talk about stress. I love it when technology works, but when it doesn’t-ugh!